Every once in a while, I forget about the slow house renovation progress and disappear off into the world of Pinterest on a fantasy level, swooning over innovative designs and wishing I owned 10 houses instead of 1 so that I could style every single one in a different way. For the most part, my style is quite uniform – a mixture of old and new but verging on sleek minimalism rather than vintage or shabby chic. Then I see a floating staircase feature wall with a glass balustrade that would look ridiculous in our suburban 1930’s semi but would look amazing in a 21st century Grand Design. My current obsession is feature walls, but not by painting a bold colour or slapping up some designer wallpaper. I love the idea of reconnecting with nature in the home and have been looking at feature wall tiles for potential plans when we reconfigure our downstairs space taking it from it’s current design of living room, dining room and pokey kitchen to living room, open plan kitchen-diner-living space, downstairs toilet and converting our existing kitchen into a utility room. We’ve also got two bathrooms that need remodeling and a lengthy garden to landscape so there is no shortage of space to implement some of the dreamy Pinterest ideas. I think tiles naturally lend themselves to bathrooms and cloakrooms because they’re so easy to keep clean and look stylish and modern. I remember bathrooms with carpets on the floor (why?) and even better, the outside edge of the bathroom being carpeted too. And carpet on the kitchen floor in a house I lived in when I was really small *shudders*. Our grand plans are to build onto the back of our house at ground floor level, creating an L-shaped open plan kitchen, dining room and additional living space/seating area looking out onto the garden. We’ve spoken about industrial pared-back style for the kitchen area to which feature wall tiles would lend themselves very well since I think exposed brick walls only work well if you have older brick and since this will be a new extension we would need to try and re-create that look…or perhaps take it up a modern notch or two. 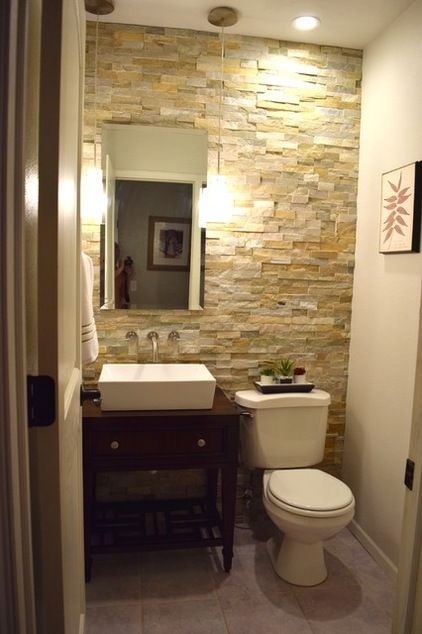 I love these feature wall tile living spaces. I love the current trend for creating a seamless indoor/outdoor space and we’ll be having the garden landscaped alongside the extension – our existing patio will be swallowed up by the building so we’ll need to have a new one built in. I don’t even want to think about how much work will be involved, the garden is around 100ft long and slopes upward so it’s not going to be straightforward but will hopefully be quite the wow-factor transformation once we finish. 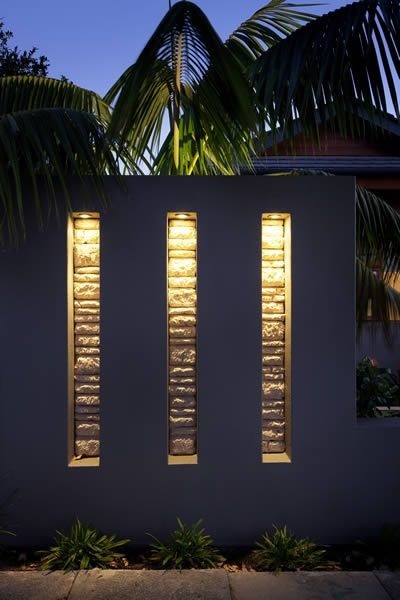 Here are some ideas I’m loving for outdoor feature wall tiles. Our major house extension plans are a long way from happening but it’s a good idea to have plenty of inspiration for when we’re ready. I have a sneaky suspicion though that my mind will change several times about what I want, probably right up until the last minute. This is a collaborative post but all words and opinions are my own. Images courtesy of Pinterest. Top image. I love that garden fountain!